Volkswagen opened a gateway to the future at the CES in Las Vegas. The time machine: a zero-emission vehicle - the avant-garde BUDD-e minivan. 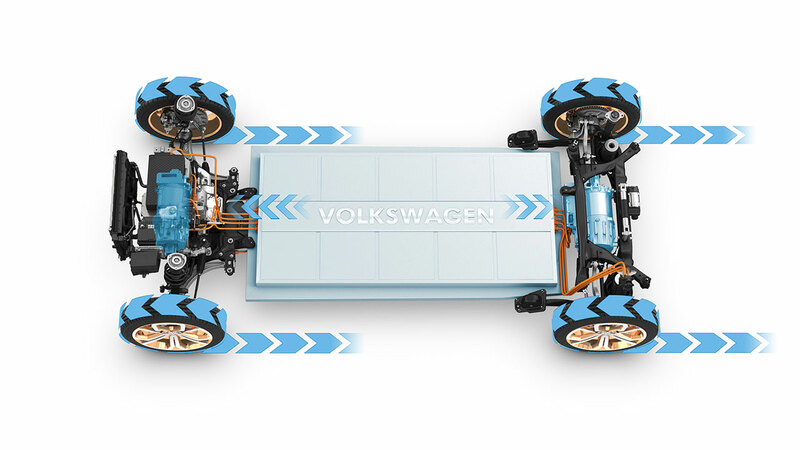 The first model based on an equally new and progressive Volkswagen technology matrix for electric vehicles. The van's range: up to 233 miles (USA/FTP 72) or 533 kilometers (Europe/NEDC). And BUDD-e also has charisma with its iconic design. A Volkswagen that breathes the brand's history, while simultaneously setting its sights on the immediate future with precise clarity. And it is as networked as possible, making BUDD-e a mobile interface between the world on board and the outside world. The car in the Internet of Things. With access to your home - Smart Home - or your workplace. Equipped with next generation Infotainment to turn travel into an interactive experience. BUDD-e offers a completely new method of operation and information processing. Everything is more intuitive than ever before. Touch and gesture control merge seamlessly; switches and buttons are a thing of the past; individual displays blend into large infotainment panels; analog mirrors are replaced by digital screens. 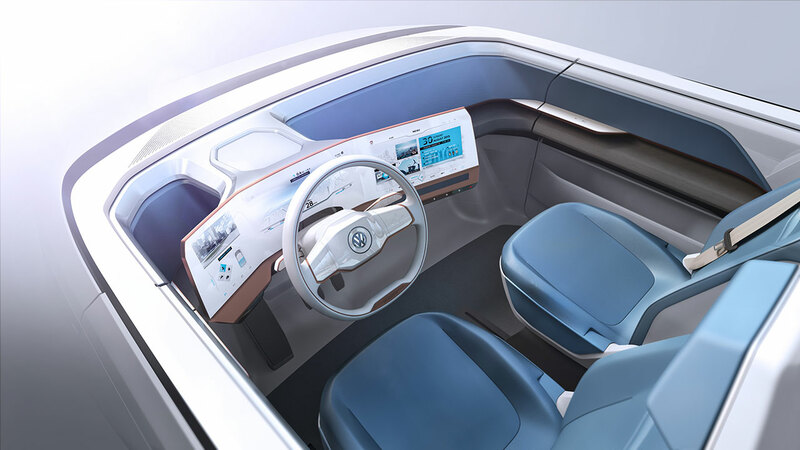 The matrix of these new, interactive infotainment and operating systems gently launches passengers aboard the Volkswagen concept car forward - to the end of the decade. The present meets the future. Volkswagen demonstrates how much travel will have changed by the time we are in or around the year 2019 at the CES on board the BUDD-e. Four friends will set off on an imaginary journey in the car from San Francisco to Nevada to go to a legendary American festival on what is to be an interactive journey into the world of tomorrow. A world that will most probably have become the world of the present in January 2016 in Las Vegas with the technologies of the future presented in the BUDD-e. 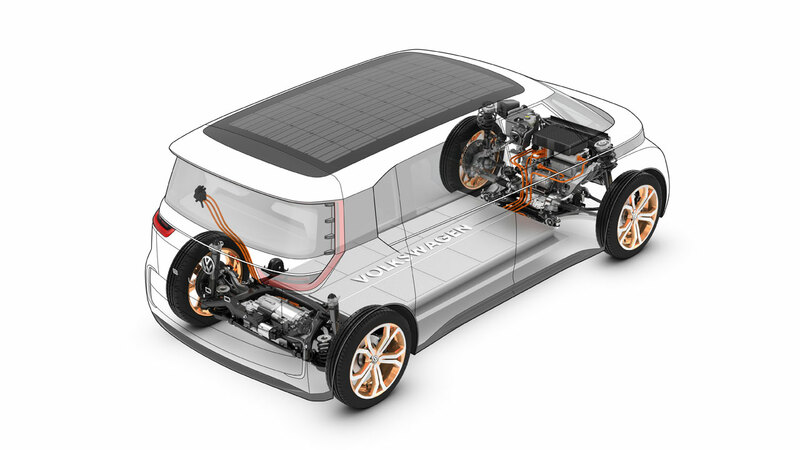 These technologies include Volkswagen's new conceptual matrix for electric vehicles: the Modular Electric Drive Kit (MEB), with which it may, for the first time, become possible for the pure electrical of large series models to match that of today's gasoline-powered cars by the end of the decade. In parallel to this, the time it takes to charge the batteries should have been cut to about 15 minutes (80 percent capacity) by then. This would mark the breakthrough of electric cars. Spacious interiors and the smallest possible traffic footprint, to make handling as easy as possible around the world. Great agility; powerful acceleration combined with maneuverability. Interiors designed for optimal use with a positive feeling for space thanks to the new vehicle architecture. Maximum functionality and networking thanks to new display and control concepts. The greatest possible degree of occupant safety. A new, recognizable and distinct design identity thanks to new proportion and styling possibilities - each MEB vehicle will be recognizable as such. Cost-effective access to e-mobility, accompanied by long ranges to match today's gasoline-powered cars, so that the car can be used as the primary car in the household. Drive system data - the first MEB concept car. 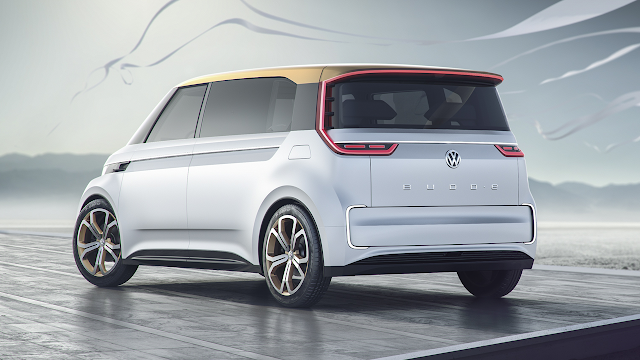 The BUDD-e being presented at the CES in Las Vegas is, as outlined, the first Volkswagen to have the DNA of the new MEB. The MEB results in a drivetrain architecture that is specifically tailored to the use of compact electric motors and high-performance batteries. The flat and space-saving battery with an energy content of 92.4 kWh is integrated into almost the entire vehicle floor of the BUDD-e. It powers two electric motors, which drive both of the axles. The front electric motor produces 100 kW (200 Nm), while the rear motor produces 125 kW (290 Nm); resulting in a mechanical system power of 225 kW. This results in a total range of up to 233 miles (USA/FTP 72) or 533 kilometers (Europe/NEDC) when the battery is fully charged, putting the BUDD-e on a level playing field with today's gasoline-powered cars. The battery can either be charged by plugging it into a power socket or by inductive charging. At a charging power of 150 kW (DC), the battery is 80 percent charged after about 30 minutes. Package - making perfect use of space. How the MEB results in entirely new package perspectives is illustrated in the BUDD-e by the arrangement of the heating and air conditioning unit: The system has been completely integrated in the front end of the car. This arrangement enlarges the space available in the front end of the car, perfects the air quality (thanks to bigger and better filters) and at the same time results in excellent acoustics (due to a reduction in fan noise). Exterior dimensions - making optimum use of the traffic footprint. The minivan, which is 181.0"/4,597 mm long, exploits the enclosed space perfectly, true to the MEB concept. The BUDD-e is 76.4"/1,940 mm wide and 72.2"/1,835 mm high, putting it between Volkswagen's Touran and Multivan T6 vans, both of which have been very successful in Europe, in terms of length; although the concept car is wider than these two well-known production models. It also shares the handy tailgate with these two models as well as featuring the Multivan's sliding door on the right-hand side. Due to its generous width and a relatively long wheelbase (124.1"/3,151 mm) with very short overhangs (27.3"/694 mm at the front and 29.6"/752 mm at the back) the BUDD-e's proportions are very taut. A newly developed rear steering system results in a very tight turning circle of 37.7 ft/11.5 m and improved dynamic response. Exterior design - functional aesthetics. The BUDD-e's designers focused on the clear aesthetics of functionality. It is not least because of this that this Volkswagen van is characterized by an iconic charm - functional, progressive, clean, powerful and likeable, all at the same time. The concept car has a two-tone color scheme, with the body painted in "Nevada White" below the window edge and the roof painted in golden "Phoenix Copper". Front end. With its front end design the BUDD-e makes it unmistakably clear that it is a Volkswagen. The area around the VW logo is particularly characteristic of the style: This part of the body, which is completely made of transparent plastic, can be backlit by the integrated LED modules in a number of different ways, creating an external ambient light that tapers towards the sides as a narrow stripe that continues all the way round the van. The headlights, which also use LED technology, are located high up. The transparent surface to the left and right of the headlights, with the integrated LED indicators, reaches a long way back into the vehicle's silhouette. 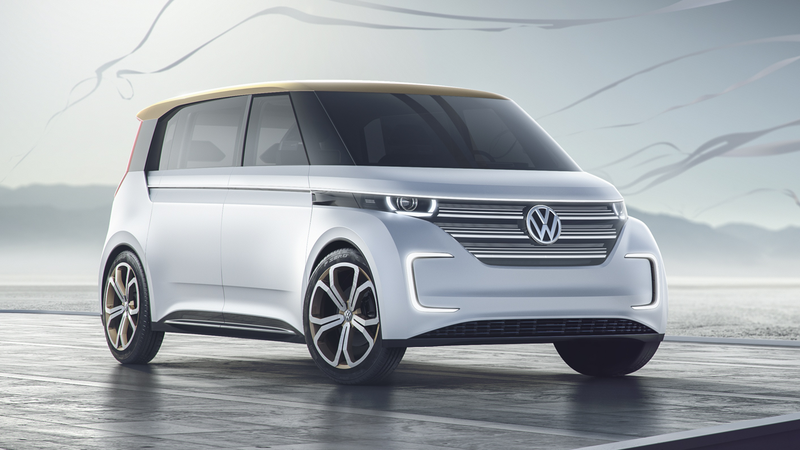 Viewed from the front, the V-shaped design of the transparent area harks back to the original Volkswagen bus and the Beetle, while transferring the theme into the future with an entirely new interpretation of this brand DNA. Silhouette. The style of the silhouette is characterized by the flat and elongated roof line, the equally long strip of windows with glazed A-pillars, the 21-inch alloy wheels and the light modules that start at the front and reach around to the flanks. Above this transparent luminous body there is, as already outlined, a narrower LED stripe, which runs all the way round the car as a character line and exterior ambient lighting. The silhouette also comes across as especially clean thanks to the non-existent door handles and exterior mirrors, as these modules have been completely redesigned and replaced by electrical solutions. If you follow the strip of windows along the side to the back of the car, your gaze is drawn to the flared D-pillars, which also contain the LED strip for the rear lights towards the top. Rear. Viewed from behind, it is evident that the airstream flows through the gloss black D-pillars; this aerodynamic conception reduces aerodynamic drag and simultaneously optimizes the downforce on the rear axle. The clean and iconic design continues all the way to the rear, with the large tailgate, reminiscent of the original Volkswagen bus, the LED strips of the rear lights that reach up into the D-pillars and the wrap-around ambient light, which give the BUDD-e its absolutely unmistakable charisma. Another characteristic feature of this electric Volkswagen is, last but not least, a C-shaped LED signature that frames the removable Drop Box. Interior design - a mobile home. The architecture of the new Modular Electric Drive Kit (MEB) completely changes the package of the car, which is a tall order for the interior designers, who had the opportunity to create a space that is hardly restricted by the drive technology at the front of the car. This is precisely what the BUDD-e demonstrates, because the conventional dashboard along with all its knobs and switches have been entirely done away with. It just isn't necessary any more in the future of electromobility. Instead, the design team arranged the instruments - the next-generation human-machine interface - as a display that looks like it is floating in mid air, like a tablet floating in the space in front of the driver. But it isn't just the driver's workplace that is characterized by lightness, but all of the interior surfaces, which are immersed in blue, silver and white. The car as a lounge. When you open the sliding door by gesture control from the outside, you enter an interior that is more reminiscent of a lounge than a car as we are accustomed to. The car as a loft, furnished as you'd like it. The driver's and front passenger's seats stand on a wooden floor. And the wood isn't plastic film or veneer, but has its genuine three-dimensional grain. If the front-seat passenger wants to talk to his friends sitting in the back, he can simply swivel his rotating seat (just like the driver's seat), which is fitted with an integral seat belt, around to face the back. In the back there is a soft, cozy carpet along with two conventional seats for the journey. When you take a break in the BUDD-e, you can also enjoy a bench arranged longitudinally to the direction of travel, and there is a 34-inch monitor integrated in the side wall of the Volkswagen (see page 21). The atmosphere in the back is also characterized by lightness. A mobile lounge where you can really feel at home. The interior shown in the BUDD-e is by no means fiction. The front seats, for instance, are based on current production solutions. The entire interior concept is designed to be feasible and affordable, as is typical of Volkswagen. Instrument and operating concept - revolution instead of evolution. The zero-emission van configured for the CES is a four-seater due to its special technical specifications. The interior style of the BUDD-e is characterized by the completely new and progressive human-machine interface - the display and control concept of the future. The design is extremely clean and intuitive to use. The whole technical architecture of the infotainment and control systems as well as their design makes a quantum leap akin to the jump from mobile phones with numerical keypads to smartphones or, more recently, from analog watches to smartwatches. Revolution instead of evolution. One World - digitization of the driver's workplace. The fact is: the traditional distinction between the electronic instrument cluster in front of the driver and the screen of the infotainment system in the center console is dissolving in the interface design of the BUDD-e, Volkswagen. Heading towards comprehensive digitization and individualization of the driver's workplace to become a large panel, these two areas are merging to form a single information hub. Graphic navigation. The idea behind the design and structuring of the panel was rooted in the car's most basic function: driving, because behind the entire panel there is a sliding 3D navigation map with graphics - the visualization of travel - that thus become the stylistic matrix of an interactive human-machine interface (HMI). This is accomplished using two physically separate displays, which blend into one visually and functionally: first of all the Active Info Display as a freely programmable instrument cluster in front of the driver and secondly the head unit (HU) as what was once a separate screen for the infotainment system. The Active Info Display comprises the conceptional focus on driver information, while the HU provides infotainment and information for all of the passengers on board. And yet both of these areas form a united visual and textual realm, as the navigation graphics and the arrangement of media content such as the display of Points of Interest (POI), playlists (audio), apps (App Connect) and online services (CAR Net) are freely configurable. In addition to all this, the main points and content should also be able to be swapped between the Active Info Display and the head unit in the future. Active Info Display - information that points the way. The BUDD-e's user-programmable instrument cluster is an evolution of the Active Info Display that was first launched by Volkswagen in 2015. Centrally positioned, right in front of the driver is a 12.3-inch curved display with a surface consisting of three individually configurable sections. Drive, control, consume. Section I, Drive: At the center of the Active Info Display, the current route is displayed as part of a 3D map including buildings, points of interest (POI) as well as navigation instructions - the edges of this navigation image are simultaneously the background of the entire display. Section II, Control: Shown on the left side of the Active Info Display are the vehicle status and assistance system information as well as the current trip data from the on-board computer. Section III, Consume: The infotainment content such as Audio, Messages, Calendar and Weather is displayed on the right. Volkswagen describes this layout, which is designed to concentrate on the route and is primarily used by the driver, as Driving mode. Alternatively, as already outlined above, there is also a Travel mode, in which - among other things - the details of the route are displayed on the head unit instead, where the route guidance and planning can also be used by the passengers. The fuel consumption data (left), speed indicator (middle) and information on the energy reserves and range (right) are always displayed in a constant position at the bottom section of the display. The head unit - information as an experience. The head unit, the part of the new HMI that can also be seen and used by the front-seat passenger and the passengers in the back, is located in the middle of the dashboard. As already outlined above, the 13.3-inch display is linked to the Active Info Display, both graphically and by software. In the basic layout the head unit displays the extended 3D navigation map (including buildings). The top level of the surface itself consists of user-assignable tiles that are available in two different sizes. Up to eight tiles in total can be arranged next to each other. Here you can display Trip Data, Audio (playlist/song/cover) or Messages/News in Driving mode, for example. Alternatively, there is also, as already outlined above, the Travel mode, where the emphasis is on the graphically perfect representation of travel content. A Home button in the middle of the head unit takes you straight out of each menu back to the top level menu. Structured. In familiar smartphone style, there is a menu tab integrated at the top of the screen. Opening this menu permits quick access to key functions and menu items. In detail, these include menu items like Music, Places, Images, Phone, Connected Home, and Videos, for example. Information on the basic functions such as climate control and seat heating is also shown at the bottom of the display, where the all-important button is also located for switching between the Travel and Driving modes and for changing the position of the visual representation of the current route on the display. Last but not least, there is an In Box on the right of the display, which can be used to send passengers' content to the head unit. The head unit is fitted with proximity sensors: as soon as a hand comes close to it, the display switches smoothly from display to operating mode, for instance to allow the user to scroll through the playlist in the Audio window. Driving and travel mode - information or entertainment. Depending on the situation it may be appropriate to switch from Driving mode to Travel mode, for instance if travel content takes precedence. In the Active Info Display the display focuses on specific navigation information, while the representation of the current route is moved to the right onto the head unit, where it may now, for example, correspond to the points of interest, which are now shown in greater detail - thus making it easier and more straightforward for everyone on board to locate POIs. The default displays on the Active Info Display, meanwhile, continue to provide the driver with the most important information for the journey. It is possible to switch between the two modes by gesture control using the Home button or using the multifunction steering wheel, which has also been completely redesigned. e-Mirror - an electronic rear view mirror. This concept integrates the displays of the digital exterior mirrors (e-Mirror). The images come from two external cameras and the system uses multifunction displays: the driver can control the ambient light using a control panel below the display, for example. If the car is stationary, the driver and front-seat passenger can also use these panels to open and close the electric doors. The display on the driver's side is 7.9 inches in size and the front-seat passenger has a 5.9-inch screen. Multifunction steering wheel 3.0 - intuitive to use. Another highlight is the completely switchless multifunction steering wheel - a feature that has never before been realized in this way. The smooth surface of the multifunctional areas use touch feedback. The individual functions are activated by pressure or with a swipe gesture. Touching the surfaces gives drivers palpable "pre-sensing" touch feedback, allowing them to localize the function. As soon as they activate the function there is another, stronger touch feedback, making operation more intuitive than can be achieved by present-day solutions. Also, in contrast to the systems we are already familiar with, operation is no longer limited to the customary shift paddle, but extends over the entire surface of the operating island. Easy-to-feel raised patterns on the buttons make it easier to find your way around. Beyond that the driver is also given visual feedback on the selected functions by the Active Info Display, e.g. Audio: The cover of the song currently playing is displayed in the appropriate window. At the same time, icons are displayed at the edges of the square window - in all four corners. These four icons (scroll up or down, sound and menu) directly match the corresponding switching directions of the steering wheel controls surface, making even the most complex operating sequences easy and intuitive. Touch slider - palpable sensor technology. Functions such as volume control can alternatively be controlled using the new touch slider. This is a further advancement of the system presented at CES 2015 in the Golf R Touch. The new stage of development is characterized by higher sensor resolution, which is clearly noticeable for drivers and front-seat passenger alike due to the system's optimized precision and performance. This enables the touch slider to recognize not only the number of fingers on the slider, but also their movements, for instance to zoom in or out of the navigation map. Gesture control 2.0 - a digital arm. Volkswagen has significantly enhanced the gesture control system presented in the Golf R Touch at last year's CES. In the BUDD-e the experts from the Body Electronics division have used sensor technology that is already capable of recognizing people as they are approaching the Volkswagen. For the vehicle exterior this is accomplished using infrared sensors. All it takes at the starting point of the journey on Columbus Avenue in San Francisco is an intuitive hand gesture to open the BUDD-e's sliding door as if by magic. A simple foot movement - of the Virtual Pedal 3.0 - opens the electrically operated tailgate; this is a further development of the Easy Open function. The gesture control system of the BUDD-e's interior is simpler and more intuitive than ever before, with the maximum operating distance having been significantly increased: Here cameras are used to sense if a passenger in the rear compartment wants to open the sliding door, for instance. Interactive displays and projections also assist drivers and their passengers when it comes to operation. For example drivers: their gestures are recognized without the gesture control system needing to be explicitly activated - as was still the case in the Golf R Touch - making it an integral part of operating procedures that are taken absolutely for granted. Ambient lighting - personalized light. The atmosphere on board is predominantly determined by the lighting mood. At CES 2015, Volkswagen demonstrated how the dominant color of the display illumination and the matching ambient lighting can be individually adapted using the touch slider in the Golf R Touch. Also embedded in this color staging is opening/start-up and parking/shut-down of the new Volkswagen: When the car is opened, the interior comes to life with the entire cockpit and ambient lighting. The ambient lighting system implemented in the BUDD-e is a further development of that system: While the lighting situation was primarily influenced by the driver and the front-seat passenger in 2015, this now extends to the entire interior of the car. On top of this, this is the first car in which the ambient lighting interacts with the gesture control system. Last but not least, the light can be adjusted to suit the countryside passing by outside. Smart Home/Home Net - an automotive habitat. Not only does the BUDD-e's completely new infotainment concept make traveling more interactive and media more tangible, it also creates a link between the car and the world of its users. But there's more - BUDD-e itself becomes part of the Internet and becomes a key to digitized realms of service and infotainment: People will be able to access their homes and workplaces from cars like this Volkswagen and control the air conditioning system, turn the lights on or off, or simply take a look online to see if the kids are home yet. @home on the Internet. @home in the car. Drop Box - a mobile letterbox. At the same time, the car will become an interactive interface to the outside world and thus part of the smart world: It is conceivable, for example, that consumables - such as new wiper blades for the car - and all kinds of shopping could in future not only be ordered from the car, but could even be delivered to the car using a Drop Box in the car that is accessible from outside. The Volkswagen reads an access code by NFC to open the Drop Box for the authorized parcel delivery service using a digital key. A mobile letter box! Connected Home - at home on the road. At present, smart home functions are controlled using smartphone apps produced by the respective manufacturers. Of course, as we all know, smartphones aren't allowed to be used while driving for safety reasons, but Volkswagen has found a solution to this challenge, too. With App Connect - Volkswagen's interface for all Apple and Android smartphones - the BUDD-e makes it possible to control certain Connected Home functions from the car while driving. At the CES Volkswagen, in cooperation with the Korean electronics company LG, will show how it is possible to check what is in the fridge from the BUDD-e concept car, for example. It's also possible to put the whole house into an energy-saving sleep mode using the BUDD-e. In future the car will also automatically make sure that the lights in and around the house go on as soon as the car approaches (home net automation). Home Net Viewer - eye contact. In parallel to CarPlay™ (Apple) and Android Auto™ (Google), MirrorLink™ is (for Android phones) a central interface for using smartphone apps in the car. All three of these apps are mirrored in the infotainment system with the Volkswagen-compatible smartphone apps. Volkswagen has bundled these apps in the smartphone integration package App Connect available for various models since 2015. At this year's CES Volkswagen will demonstrate, together with the German manufacturer Doorbird, how MirrorLink™ can also be used in connection with the newly developed Home-Net Viewer to display images from cameras mounted in and around the house on one of the screens in the car (a scenario that it equally conceivable with CarPlay™ and Android Auto™). For example: if a visitor rings the doorbell at home, an image of them, taken by the home camera, is sent to the screen of the infotainment system. But there's more! It is even possible to speak to the visitor using the car's hands-free system and, if you wish, open the door for them. Home-Net don't forget - don't forget anything. It may seem a bit like artificial intelligence, but BUDD-e can remind users if they have forgotten anything in the car, via their smartwatch and/or their smartphone. You can also find things in the car using "Home-Net don't forget". Using an inventory list the driver or passengers can see everything that has been put in the car. But that isn't everything! The intelligent Reminder also lets you know about certain things that ought to be in the car in certain situations. For example, if rain is forecast, BUDD-e reminds the driver that there isn't an umbrella in the car at the moment. The relevant items are equipped with a transmitter (a small sticker) in advance, making it possible to locate them. The "Home-Net don't forget" app uses an encrypted wireless interface, meaning that it is impossible for the items to be located from outside the car or by unauthorized users. Smart Gesture - the car opens the door at home. Volkswagen plans to become one of the first manufacturers to integrate gesture control into affordable mass production cars. The manufacturer will showcase the BUDD-e in Las Vegas to show how broad the range of possibilities is. 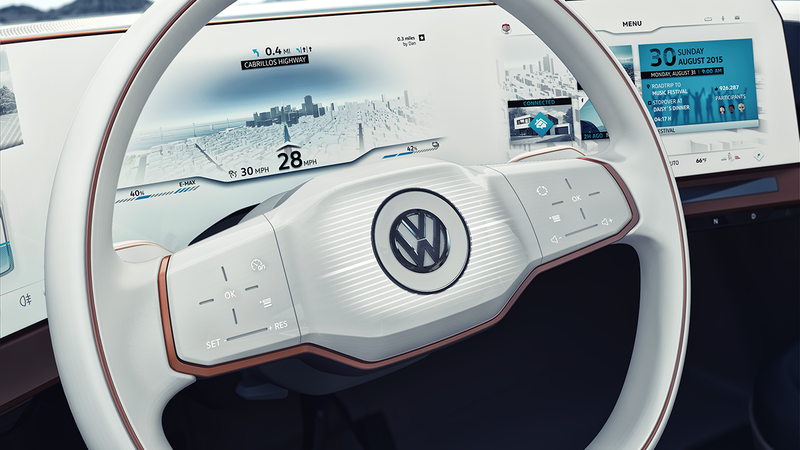 Using this car it will in future also be possible to make use of the gesture control functions in the car to operate certain functions at home, as Volkswagen will also explain at the CES. It does this using the familiar Easy Open function, for which the BUDD-e can use a laser to project a virtual footprint in front of the tailgate. If an authorized user kicks this spot, the tailgate opens automatically. Opening the door at home works in the same way: BUDD-e project a footprint in front of the door and if the person who lives there puts their foot on it, the door opens - very handy if you have your arms full of shopping bags. Of course some alterations need to be made to the door in advance and there also needs to be a software link for this to work. The idea/our journey. August 25, 2019 San Francisco. Friends say goodbye to each other. Messages fly to and fro over the net via smartphone, smartwatch and tablet. Time to get out of town for a few days. We leave in the morning. Time to spend some time together, at one of the most legendary festivals in the USA in the Nevada desert. Once a year this location becomes an oasis for art, music and individualism. A festival to celebrate life, which culminates on the sixth day of the eight-day festival, when an enormous human figure is set ablaze. The friends soon agree on where to set off on their trip to Nevada from: Columbus Avenue in San Francisco. This is where the friends plan to set off for Nevada in the BUDD-e. Before them lie about 500 miles of interactive travel in a zero-emission vehicle, including a refreshing stop en route at Lake Tahoe. Preparation/Travel app. The trip is confirmed. The driver has sent each of the friends' information about the journey, including details of the proposed route, to their tablets. This is followed by interactive planning of a kind that has never been seen before. In the pre-2019 world you could, of course, think about what music would be cool and appropriate on your playlist, or which Points of Interest (POI) you would like to see or visit. But now you can plan all of this in advance on your tablet as Our Journey using the new Volkswagen Travel App and then integrate it straight into the BUDD-e's navigation guidance system using the brand new interfaces. Even the playlist is customized to suit the route: Each of the passengers plans what they would like to listen to, see and do en route from San Francisco to Nevada before setting off. For example, the playlist: Their route will take them out of the city over the Oakland Bay Bridge, heading towards Lake Tahoe. So they can simply drag an appropriate song like Hotel California (the live version from Hell Freezes Over that is perfect for cruising to) onto the tablet by dragging it from of the media library to route guidance for the leg of the journey before the Oakland Bay Bridge. During the journey the song by the Eagles will then be playing exactly as they are leaving the city and crossing the bridge, turning travel into a pre-programmed musical experience. For example, the Points of Interest: The direct route to Nevada takes them along highway 80 towards Oakland Bay Bridge with a minor detour past the legendary Ferry Building - the main building of the San Francisco Ferry Terminal, where commuters from Sausalito and other towns in the Bay Area and tourists with their rental bikes stream in and out of the city every morning and evening. But it would also be nice to have some breakfast in one of the many inviting restaurants in the Ferry Building Marketplace, enjoying the view of the Oakland Bay Bridge, before the long journey to Lake Tahoe. So they use the slide function to add the location as a POI on the route. Now BUDD-e will stop there en route. This lets all of the passengers on board assign their favorite songs and locations, as well as videos and photos, to route guidance. For example, charging the batteries. Of course, the driver, who has planned a stop-over at Lake Tahoe, also has the option of planning the route interactively, and has already found the inductive charging station for BUDD-e and assigned that as a POI in the navigation system, too. Lake Tahoe is marked as a POI as well. On the road, the infotainment system can also provide useful information such as the current weather and water temperature. For example, the destination. The festival in Nevada is also saved as a POI using the tablet. All of the key information about the event is now available in the car whenever it is needed and can be displayed on one of several screens. And of course the group's arrival is rounded off perfectly by appropriate music played at just the right moment. Start/welcome aboard. August 26. Starting point San Francisco. The driver and his friends meet up at Baker Beach. He opens the sliding door on the passenger side of the BUDD-e using gesture control. Each of his passengers has their own tablet with the new Volkswagen Travel App with them; they use this app to plan their interactive requests for the trip. A sensor in the car automatically recognizes and locates each of the passengers' tablets, and it doesn't matter at all whether they have Android or Apple OS. Now the new Volkswagen Travel App automatically merges all of the details selected before the trip to the festival in Nevada: First the car welcomes the passengers on board using an avatar that was personalized in advance. Above each of their seats there is also individualized ambient lighting in each passenger's favorite colors, which they also selected in advance using the app. On a 34-inch monitor (on the left in the back) the images from the tablets are bundled and the personalized playlists, photos, videos and POIs are merged for the common journey. By the way, in the BUDD-e the tablets are charged inductively, too. On the road/experience and share. BUDD-e and the friends leave San Francisco behind them. On the road they alter and augment the list of Points of Interest and load more songs to the playlist for the itinerary. At the same time, the new entries are displayed on the 34-inch screen to display the detailed trip itinerary. On the way, the passengers can also use GoPro cameras to take photos or videos on board and of the route. These can also be shared via WhatsApp etc. from the car or be collected and mailed as a complete travel diary, which lets other friends take part in the most legendary present-day festival in the USA, even if they couldn't make it to Nevada in person in 2019. Automated driving/a relaxed travel experience. The option of the BUDD-e driving autonomously is also implemented. The Volkswagen Group is among the pioneers of autonomous driving. Back in 2005 Volkswagen won the "Grand Challenge" - a race covering a distance of 136,7 miles (220 km) for autonomous cars - with the Touareg luxury SUV in the USA. The prototype, christened "Stanley", was developed by the Volkswagen Electronics Research Laboratory (ERL) in Palo Alto, California in cooperation with Stanford University. Since then the development of autonomous driving has been making rapid progress and evolving up to the present day. In 2015 the group brand Audi sent the A7 piloted driving concept - equipped with laser scanners, long and mid-range radar sensors and four cameras at the front and rear - drive autonomously from ERL in Silicon Valley to the CES in Las Vegas, a distance of 560 miles (about 900 kilometers) with enthusiastic media representatives on board the concept car. Also, Volkswagen sent the e-Golf Perfect Parking at the CES 2015 in Las Vegas to an inductive charging station autonomously, using a smartphone app. Partially-automated present/step by step. There have already been Volkswagen assistance systems in production models for some time, to automate certain individual functions, such as the Traffic Jam Assistant (automatic steering, braking and accelerating in stop-and-go traffic up to 37 mph / 60 km/h), Adaptive Cruise Control (automatic braking and accelerating at high speed on the highway), the Autonomous Emergency Braking Front Assist including the City Emergency Braking System with Pedestrian Monitoring, Lane Assist and Side Assist (automatic lane tracking and counter-steering when changing lanes when there is a vehicle in the blind spot), Park Assist (autonomous parking, including automatic steering and braking), Rear Traffic Alert (which recognizes approaching vehicles when reversing out of a parking bay and applies the brakes) or Emergency Assist (which stops the car automatically and activates the hazard warning lights and sends an SOS emergency call if the driver becomes incapacitated). Partially-automated becomes fully-automated/systems merge. By around the end of this decade - in about 2019, when the BUDD-e would be on its way from San Francisco to the festival in Nevada -the functions of the assistance systems such as those in the Audi A7 piloted driving concept and the e-Golf Perfect Parking research vehicles and the systems already available from Volkswagen, for instance in the Passat and Golf, could merge and make fully automated driving an everyday reality. With two objectives: to minimize accidents and maximize comfort on long journeys. Volkswagen's technical toolkits are designed to allow the latest features to be integrated step by step as we progress towards fully automated driving.